In stock -This product will ship today if ordered within the next 11 hours and 5 minutes. 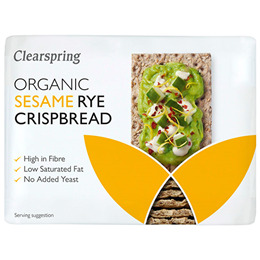 Clearspring`s delightfully crunchy organic rye crispbread is baked to a traditional Scandinavian recipe with just four simple ingredients: rye flour, sea salt and water, topped with sesame seeds for an extra nutty flavour. Wholegrain rye flour* (76%), rye flour* (11%), sesame seeds* (9%), sea salt. Enjoy with your favourite spreads, dips and toppings, or as an accompaniment to salads and soups. Below are reviews of Clearspring Organic Rye Crispbread - Sesame - 200g by bodykind customers. If you have tried this product we'd love to hear what you think so please leave a review. It's ok but prefer dark Ryvita which is slightly bigger and tastier.